Images of Near Southeast from not too long before I picked up my own camera. Note: I did not take any of these photos. I link to the original site where possible (respecting copyright!). See my other Historic Photos page for older Near Southeast images. The following color images, taken sometime between 1992 and 1999, come from the Carol M. Highsmith Archive, Library of Congress, Prints and Photographs Division. You can see a larger version here, or you can download the 72 MB original .TIF here. The overview photo from the Carol M. Highsmith Archive, starting at I Street and South Capitol and looking to the southeast. Looking down on what was the Tracks nightclub at 1st and M SE. At right are the outdoor volleyball courts. It was demolished around 1999 to build the 80 M Street office building. The Southeast Federal Center, showing buildings that are still standing as well as ones that were demolished around 1999-2000, including the two low-slung brick buildings right along M Street next to the old white NGA building, a brick annex to the red building at 3rd and Tingey behind what is now the US DOT HQ, and the large Building 159, nestled between the DC Water main pumping station and what is now the Foundry Lofts. 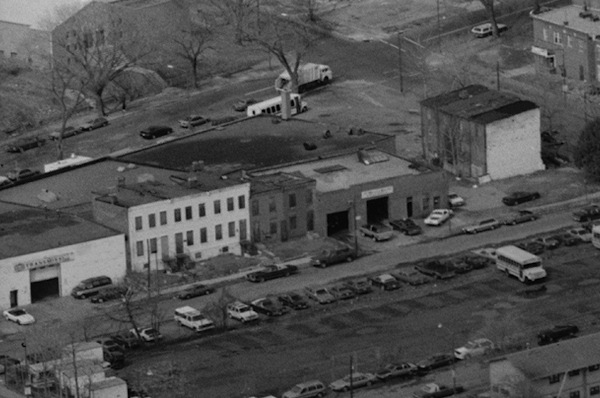 Building 167, now the Boilermaker Shops, is visible at left center, and interestingly shows that the loading dock that has been added on the western end of the building at 3rd Street is an echo of a portion of the building that was there before. On Half Street between K and L, you can see the J.E. Hurley Machine and Boiler Works site (see also a ground-level view of the building from around the same time). This became the Nation nightclub, then the 1015 Half Street office building. The Half and M intersection, showing at left the newish entrance to the Navy Yard Metro station, before 55 M Street was built on top of it in 2007. At right is the WMATA Southeastern Bus Garage, which was vacated when Nationals Park opened one block to the south, then demolished in 2009. The Capper/Carrollsburg public housing project, between K and M and 2nd and 7th. Most of these buildings were demolished between 2003 and 2007. At bottom you can see the school bus lots that eventually became Canal Park. At center is New Jersey Avenue, running from K Street at left to M at right. The buildings between K and L, where Capitol Hill Tower now stands, were demolished between 2001 and 2003, as were the car repair shops at New Jersey and M, clearing that block for the 1100 New Jersey Avenue office building. At bottom along 1st Street are many buildings that existed until 2006-2011, including the Market Deli. These four color images, provided to JDLand in early 2013 by a reader who was given the prints, show M Street SE during the time of the Navy Yard Metro construction station, probably in 1990 or early 1991. The following black and white images, taken in 1992, come from the massive National Park Service's HABS, HAER and HALS archive of photos, available online thanks to the Library of Congress. I have cropped the original images severely in order to highlight particular points of interest. The originals are from surveys of Virginia Avenue, New Jersey Avenue, and Potomac Avenue. New Jersey Avenue SE at M street, showing mainly the western side of the block. At bottom center is the very tidy and new eastern entrance to the Navy Yard Metro station, which opened the previous year. 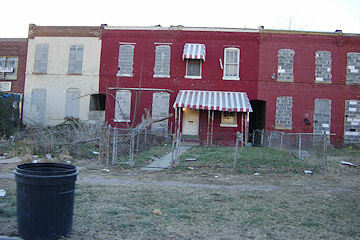 At least seven townhouses, already boarded up, stand between the station plaza at St. Matthew's Church, at upper right. These townhouses were demolished some time before 2003. (See what it looks like now from ground level.) The buildings along the left side of the photo were demolished in 2006 to make way for both the Onyx apartment building and the 100 M Street office building. A portion of what was then the Southeast Federal Center, as seen from the west. The large white building behind the ornate WASA main pumping station is Building 159, which was demolished in the 1999-2000 timeframe despite the desire of historic preservationists to save it. 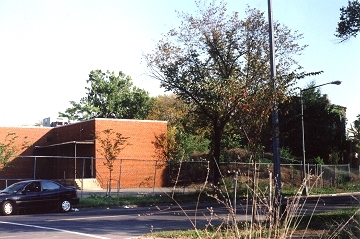 It stood on what is now the footprint of the Yards Park, and is obscuring the view of the Pattern Joiner Shop (Building 160) and the Lumber Storage Shed, both of which are still standing today. Most buildings in the forefront are part of WASA's operations and are still in use today, though this view would now be obscured by Nationals Park. First Street SE at M Street. Another image of the Tracks nightclub, seen on the left side of First Street; it operated from 1984 to 1999. That block is now home to the 80 M Street office building (see what it looks like now from ground level). Across the street, at the corner at lower right, is the On Luck carryout, demolished along with its neighbors in 2006 to make way for the 100 M Street office building (see what it looks like now from ground level). This photo, looking west from above 11th Street SE, is notable mainly for showing the four high-rise Capper buildings along Seventh Street and Virginia Avenue that were demolished in 2000 and that I never photographed. (The fifth, at upper right, was demolished in 2004.) You can see how K Street, at mid-left, still ran through from Fifth to Seventh; it was blocked off sometime before 2003. That large block is now home to both a Marine barracks and the new Capper Seniors building completed in 2006. At left is the old Capper Seniors building, demolished in late 2007. Most of the buildings in the foreground are unchanged from what is seen here. Square 738, bounded by New Jersey, K, First, and I streets SE. The building at the north end of the block was at this point either still the notorious Chapter III nightclub, or about to become the Mirage; by 2003 it was the Nexus Gold Club. The townhouses at center were mostly boarded up by 2003. A heavily cropped image show the blocks around First (at right), Half, I (top), and L (bottom). At the absolute far lower left is a smidgen of the building at 1015 Half Street, which appears to still be operating as the Hurley Boiler company, though the building would be auctioned off later in 1992. It then beceme the Capitol Ballroom in 1995, then Nation in 1995, operating until it was closed in 2007 to make way for a new office building. The other buildings appear mostly unchanged from what I began photographing in 2003, except for the smokestack rising from the building at left center at the corner of Half and I, which was home to a towing company when it was demolished in 2008. At lower left/center you can see the entrances to the nightclubs that in 1992-ish were Lost & Found and the Zone; before long they would become Wet (1999) and Edge (1993). The entire block was demolished in 2006 to make way for Velocity. At the extreme bottom right is the Market Deli, which was demolished in 2011. Squares 737 and 739, between New Jersey Avenue and Second Street, just south of the Southeast Freeway. The trash transfer station on the south end is being demolished in 2012; to its north stood a Washington Star/Post warehouse. The white building was much more ornate and interesting than it appears here, and I'm mainly including it because I weep every time I see it and remember that I didn't photograph it before it was demolished in 2000. The two blocks will eventually be redeveloped, with the northern half becoming a 1.1 million square foot residential project and the trash transfer site becoming a mixed-income apartment building. The Washington Gas and Steuart Oil sites on the east end of M Street, bounded by the SE Freeway ramps to Pennsylvania Avenue and the 11th Street Bridges. By 2003 the open field at top center was home to Maritime Plaza buildings I and II; the triangular lot seen here with huge tanks may someday be an 800,000-square-foot mixed use development.